Yesterday I had the opportunity to head down to the Taste of the Danforth Greek food event here in Toronto and I had a good time. There was a lot of tasty Greek food and I took a bunch of photos which can be found in my Taste of the Danforth flickr gallery if you are interested. All of the great Greek food just whet my appetite and I wanted more. While I was eating the fresh zucchini salad the other day, I thought that it would make a great filling for a phyllo pie like a spanakopita . For the recipe I pretty much just took the zucchini salads recipe and added some eggs as a binder, wrapped it in phyllo dough and baked it until it was golden brown. The zucchini phyllo pie turned out great! The phyllo ended up nice and golden brown, light and crispy and good. The herbed zucchini and feta filling worked really well in pie form and it was nice and tasty. I liked the combination of the fresh dill, mint and parsley which added a ton of flavour and a sense of freshness to the pie. I have really been enjoying these savoury phyllo pies and I can’t wait to try some new ones. Brush the bottom of a 13×8 inch baking pan with olive oil. Brush the top of a sheet of phyllo dough with olive oil and place it in the pan. Repeat until you have 6 layers. Place the zucchini mixture on top of the phyllo dough. Brush the top of a sheet of phyllo dough with olive oil and place it on the zucchini filling. Repeat until you have 6 layers. Bake in a preheated 350F/180C oven until golden brown on top, about 30-50 minutes. Sounds very tasty. Did you consider yellow squash as well? Perhaps pimiento or red bell pepper? That could make for some exciting colors. ghweiss: Yes, I used a combination of green and yellow zucchini thought he yellow is harder to see in the photo. 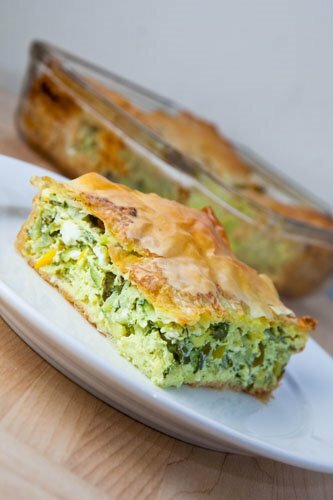 My Thea makes a gkyki (sweet) kolokithopita similar to this recipe, but she uses the abundance of summer squash and zucchini in her garden come this time of year. It's quite possibly my favourite dessert ever – great warm but even better after it sits in the fridge, where it becomes almost custard-like. Yummmmm,I can’t wait to try this! That is a great way to use the summer veggies! I'm glad I just ate or I'd be drooling. What a great variation on spanakopita! I'm very interested to try this and it would be the perfect way to use up some of the zucchini and yellow squash in my garden. Sounds great! I love spanakopita, so I think I will try this next. A beautiful pie! Your kolokithopita looks so delicious! Nice. I tried making the spinach version once. Didn't turn out as great as I'd like. This looks fantastic. I may have to try this again and soon but maybe I'll use zucchini the next time around. I went to the Danforth today… during the rain storm = not a good idea!!! I wish I had seen/tasted something like this, delicious!!!! Fabulous! I am totally overrun by zucchini at the moment and I can't take another loaf of zucchini bread! Wish I could have gone to this place. I love Greek food. You make me hungry with your beautiful pie. It will be difficult to beat the simplicity of this dish!!! I love the crunch of the baked phyllo!! What a fabulous change to typical spanokopita! I wish I could have gone to the greek festival! Greek food is the best. This is such a good idea for a phyllo pie. I am definitely bookmarking this. Looks delicious and is definitely my kind of dish! Um, yum? What a different way to use up summer's bounty of zucchini. Looks great! I have a weakness for spanakopita, and this looks like a terrific version! What a great idea. Yum – this looks really, really delicious. Looks great Kevin! We have a greek fest here in a couple weeks – always such great food! Looks so yummy! I would like to have more than 1 slice. Oh Kevin, that looks just wonderful! I will try it, thanks for sharing. That sounds good with all that feta, and the herbs, yum! Wow this looks wonderful Kevin! I'm gonna share this with Carol too, she plants zucchini in her garden and will be looking for recipes to use it! i love all of your greek recipes! Yum that pie looks delish – you did a great job of that Kevin! Mmm another delicious creation of yours Kevin! Maria Pontikis: The sweet version sounds good as well! This looks awesome! Perfect for all of that summer zucchini! I made this last night and had it for lunch today. This is such a simple, tasty and different way to use up a lot of the summer squash I'm overrun with! Next time I'll try adding some diced ham and red peppers. Wow! Looking at the photo makes my mouth water!! Going to try this out soon! Kevin, the pie's amazing! my phyllo pastry, tho, came out rather like paper on top, not shiney, nor crunchy, but dull. Anonymous: Glad you enjoyed the flavour! Was the phyllo not light and flakey and golden brown? I normally brush it with oil as in the recipe and it comes out light and flakey and golden brown. What shelf did you have it on in the oven? It should be closer to the top and it should be left in the oven until it is lightly golden brown. I'm making a spinach itallian pie spankopita style in phyllo . Yum. Spinach, riccotta, sausage, parmesian, egg, and herbs, onion and garlic. It comes out awesome. absolutely delicious! thank you very much for the wondrful recipe!